has one of the most interesting back stories of all the elements that have ever been discovered. Way back in the early 1730s, a scientist named John Winthrop found an ore in Massachusetts of all places and sent it over to England to be examined further. However, it sat untouched for the most part in the British Museum Collection for many years before several scientists took a crack at analyzing it in the early 1800s. Charles Hatchett, William Hyde Wollaston, and Heinrich Rose, all studied the ore at various times and found different things. But it was Rose who eventually revealed that the ore contained an element that he called niobium. Today, niobium is known for being a ductile and shiny metal that is able to resist corrosion and keep all of its physical properties when it’s exposed to extremely high temperatures. It’s used to build things like gas pipelines, auto components, capacitors, and more. 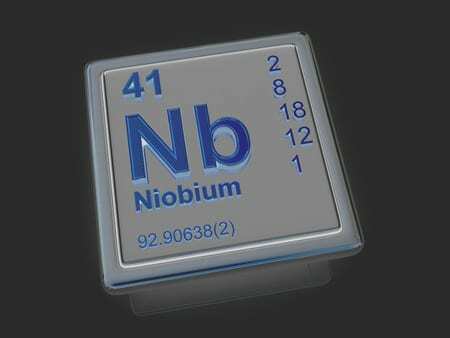 Here are some other interesting facts about niobium. It was named after a Greek goddess. There are a handful of elements that are named after Greek figures. Niobium is one of them. It got its name from Niobe, who was the Greek goddess of tears. Niobe was also the daughter to King Tantalus, who inspired the name for the element tantalum. Niobium and tantalum are almost always found side by side in nature. It is mostly mined in Brazil and Canada these days. According to the U.S. Geological Survey, most of the niobium that is mined today is found in Brazil and Canada. The USGS believes there is enough niobium in the crust of the Earth to last for about 500 years. Most mined niobium is utilized in the steel industry. The majority of the niobium that is mined in Brazil and Canada is taken and used to create low-alloy steels that are very strong and durable. Along with tungsten, tantalum, rhenium, and molybdenum, niobium is often referred to as a refractory metal because of its high resistance to heat. Could your company benefit from using niobium? Eagle Alloys can provide you with niobium sheets, rods, wire, and tubing. Call us at 800-237-9012 today for more fun facts about niobium and its many uses.